Well, not exactly that specifically, but still . . .
As you splendid readers might remember (c’mon, it was only yesterday), the hardreading staff couldn’t help but note the fuddy local tabloid’s tut-tutting about Gov. 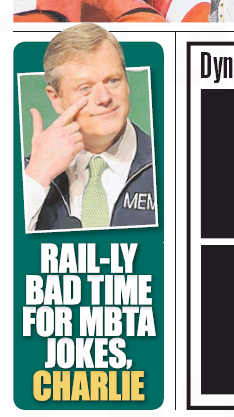 Charlie Baker’s St. Patrick’s Day skit lampooning the MBTA (Maybe Better Tomorrow, Alright?) and its snow woes. Today, Herald columnist Joe Fitzgerald essentially told his bosses to put a sock in it. Charlie Baker, this one’s for you. 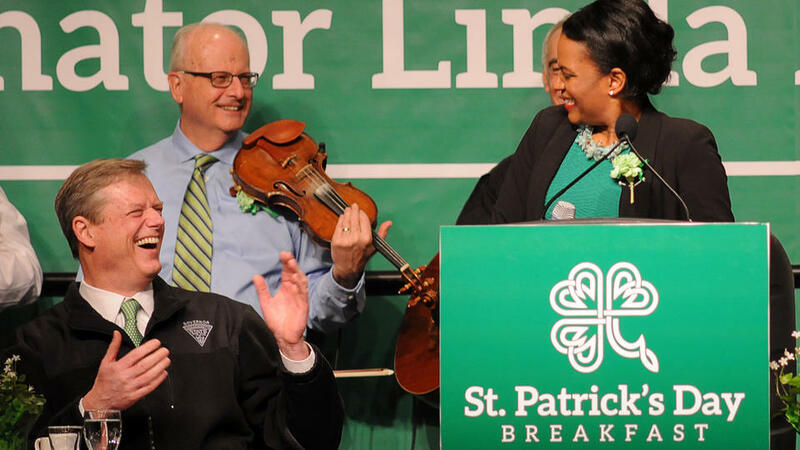 If you saw yesterday’s Herald, you read of the governor’s give-me-a-break response to knee-jerk critics who charged he should not have made lighthearted references to dysfunction at the T three days ago at the St. Patrick’s Day breakfast in Southie. Too often the jokes on Beacon Hill are on us, which is what made Baker’s slapstick such a breath of fresh air. As opposed, presumably, to all the hot air coming from the umbrage-industrial complex. Let’s just hope Fitzgerald got the last word on this idiotic riff. We’re pretty sure the Heraldniks can come up with a different idiotic riff without too much trouble. This entry was posted on Wednesday, March 18th, 2015 at 1:06 pm and is filed under Uncategorized. You can follow any responses to this entry through the RSS 2.0 feed. You can leave a response, or trackback from your own site.